I am finally starting to work on Christmas projects and today I opened a new Sizzix die that I recently bought from the store. There are a total of 10 bigz dies that come with a bonus textured impressions folder and this one is the stocking die. I made mine into a card by first folding the cardstock in half and placing the fold at the top of the stocking. I used the elephant from Dandelion Designs new cling set called "happy hello". The lollipop is from the "so sweet" set. I used glossy accents on the lollipop to give it a shine. I'll be at the store tomorrow doing a make & take from 10-12 pm. We'll be using a bunch of these stamps. Thanks for stopping by today and hope you have a wonderful weekend!!! Ohhh, that IS a very bright stocking. The embossing is super nice too. What a cute stocking card! I love how you textured the stocking. I hope I can make it to the store tomorrow. Yes! More new goodies to collect...and use LOL! I think you did a clever job of combining the Sizzix die with the Dandelion stamps. hi cheryl, is this the same sizzix stocking die that stampin up sells as well? or is the SU one bigger?? it is sooo cute! thank you! Hi Eva, no it is a Sizzix die. They made the SU one a little different. I'm not sure about the size. Thanks for stopping by. Cute card, Cheryl! Love the glossy accents onthe lollipop, too, great idea! BTW, met an old freind of yours and she told me to tell you "HI!" she didn't give me her name but said you would know her, the Sears Halloween costume shop lady!Fun lady! Oh...the people you meet at Zippy's in Hawaii Kai! thanks for your quick response, cheryl!! i love shopping at j's! Cheryl I love how made it into a card! This is cute! awe...so cute! glad to see that you are getting ready for Christmas. I am so happy that I can now move back into the renovated space, but it's taking time. at least I can start to craft again! have a wonderful week! Everyone's getting ready for the Christmas and cards/scrapbooks shoudn't be ignored from the to-do-list. This card is definitely something that I should do soon. 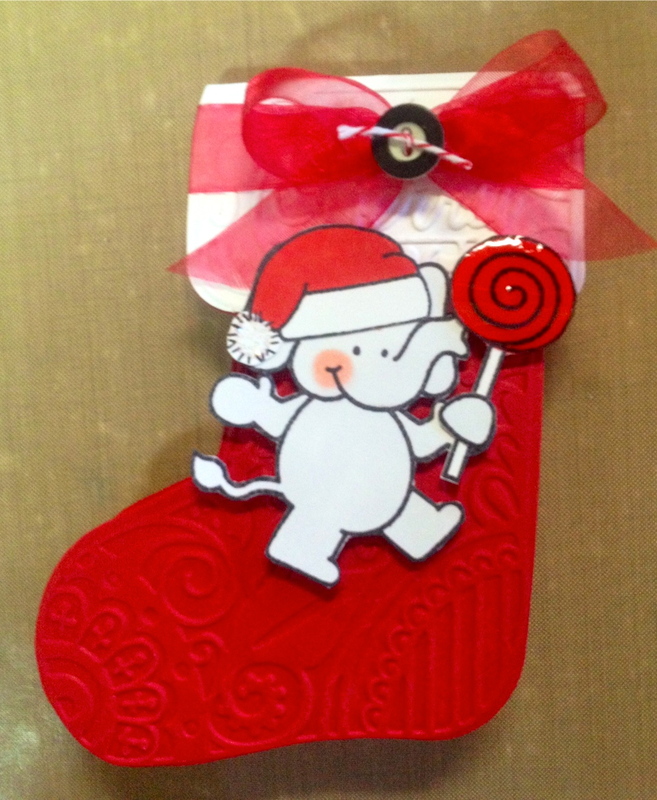 The stocking and lollipop are lovely.Having the background paper embossed made it look more cute.